Perhaps even creepier than spiders are city spiders. New research has found the humped golden orb-weaving spider grows larger and produces more eight-legged babies in urban areas. This spider (Nephila plumipes) is indigenous to the Australian countryside, but it's also commonly found in and around urban areas, like the city of Sydney, in southeast Australia. And despite the fact that it's not their native landscape, these city-dwelling spiders are thriving, according to the study by researchers at the University of Sydney. The heightened ability to adapt to urban environments has earned this spider a reputation as an "urban exploiter," said lead researcher Elizabeth Lowe, a doctoral candidate at the university's School of Biological Sciences. "The effects of urbanization on wildlife are very varied -- some do well, others don't," Lowe told Live Science in an email. "Animals which benefit from urbanization are called urban exploiters, and these species (including the spiders from this study) do better in urban areas than their natural habitats." For the study, Lowe and her colleagues collected over 200 orb-weaving spiders from urban, semi-urban and semi-rural sites in and around Sydney. The urban and semi-urban sites included parks and gardens, as well as patches of vegetation surrounded by houses and other buildings. The semi-rural sites were less developed, consisting mostly of native shrubs and other vegetation, with few buildings nearby. The researchers found that spiders living in the urbanized areas with low vegetation had larger tibias (a segment of the leg used by researchers to estimate spider body size) than their counterparts in semi-rural areas with high vegetation. 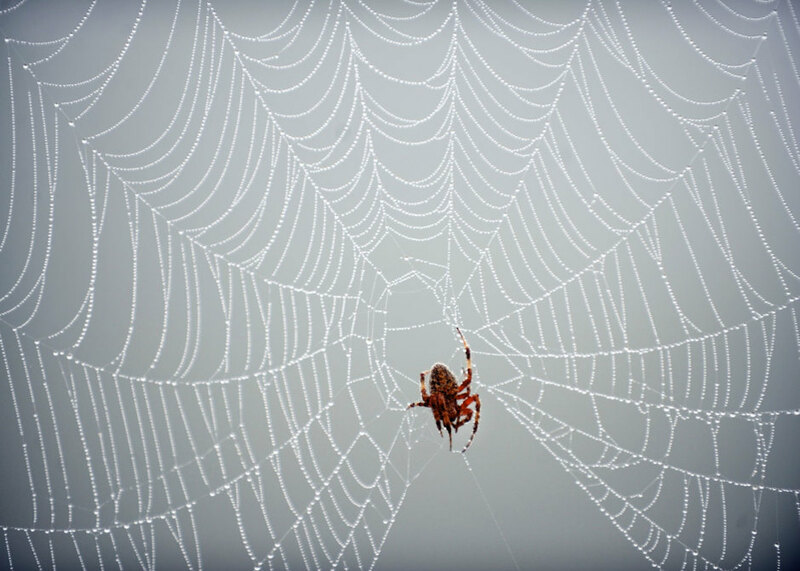 The average tibia size of all the spiders collected was about 0.42 inches (10.74 millimeters), but the city spiders had significantly longer tibias, measuring up to 0.55 in. (14.03 mm). These urban spiders were also found to have ovaries that weighed up to 39 percent of their total body weight, the largest ovary to body weight ratio observed for all the spiders collected. These larger ovaries indicate a higher reproductive capacity, the researchers said. The findings suggest that despite being more developed, areas with lots of buildings and roads are great places for these spiders to live, the researchers noted. The explanation for the species' city-loving habits is straightforward, Lowe said: These spiders like the heat. "Hard surfaces [like buildings, roads and concrete] retain heat, leading to the urban island-heat effect," Lowe said. "This increase in temperatures is likely what is leading to increased growth of the spiders." The urban heat island effect describes built-up areas that are hotter than nearby rural areas. Temperatures tend to increase in areas where buildings, roads and other infrastructure, which retain heat well, have replaced open land and vegetation, which help cool down the air, according to the U.S. Environmental Protection Agency (EPA). In addition, all of the energy produced in cities creates more heat compared with rural areas. Heat islands can be up to 5.4 degrees Fahrenheit (3 degrees Celsius) warmer than surrounding areas, according to the EPA, making them ideal homes for the heat-loving orb-weaving spider. The spider's affinity for urban areas also benefits humans who live in these cities, Lowe pointed out. "It is definitely not a bad thing to have spiders in the city," said Lowe, who noted the orb-weaving spider's tendency to feed on mosquitos and other insects that pester urban residents. While the spider bite of a humped golden orb-weaver can cause localized pain and numbness for humans, these spiders rarely bite people, according to Lowe. In fact, Nephila plumipes is more likely to hide from humans than to hurt them, she said. The study was detailed online on Aug. 20 in the journal PLOS ONE.